Which powertrain do punters want? 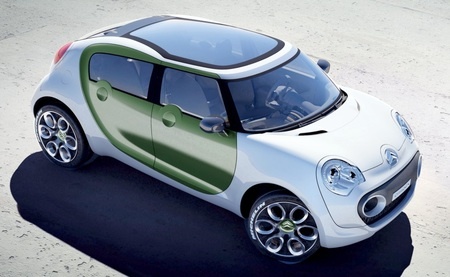 'Leccy Tech Yes, it looks like a Mini, but Citroën's concept hybrid, the C-Cactus - named, presumably, because it's less thirsty than other cars - looks set to go into production, the Gallic automaker as revealed. And it may arrive as a true electric vehicle. Citroën said it has begun looking at how feasible such a move might be, with the evaluation taking in three power systems: electric, hybrid and traditional. The latter's said to centre on a 1l engine capable of pumping out no more carbon-dioxide than 100g/km. The hybrid option is a diesel-electric job that reduces that emission total to 78g/km. The electric model would emit no CO2 as its humming along les boulevards. Citroën indicated this C-Cactus would have a hundred mile (160km) range and a top speed of 70mph (112km/h). Citroën also stressed the C-Cactus' simplicity of construction: the doors, for example, comprise two parts not the 12 used in conventional car construction. A fair few for the car's parts are made from recycled elements, it added - that taller-cabin-at-the-front-than-the-back Mini look for one, we'd say. The French company also said it had hacked away lots of interior in-essentials: the dash has gone, for instance, replaced with a display in the centre of the steering wheel. Alas, Citroën didn't disclose when the evaluation project's findings will be reported or when, later on, the C-Cactus will being rolling off the assembly lines.